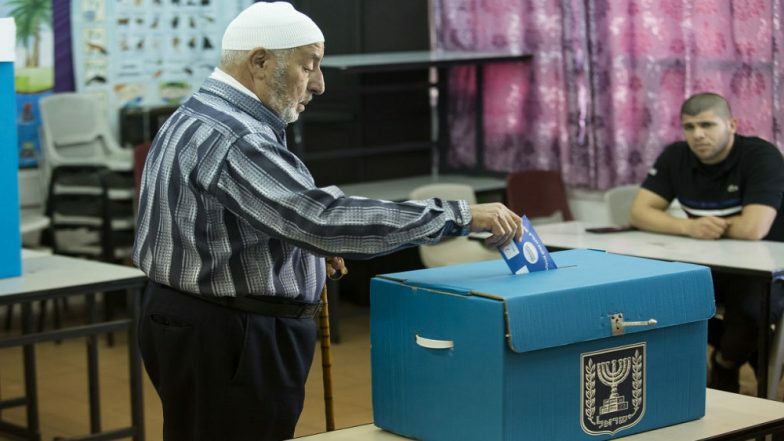 Tel Aviv, April 9: Activists of the far-right Lukid Party installed over 1,200 cameras at polling stations in Arab-dominated booths, in an apparent bid to discourage participation of Muslim electorate in the ongoing Israel general elections 2019. Their attempts, claim pollsters, have yielded results as the participation of Arabs has almost been negligible, bringing the overall voter turnout to be 52 percent so far -- which is reported to be a "historic low". Prime Minister Benjamin Netanyahu has defended the installation of cameras, although it has been deemed illegal by the Central Election Committee. Speaking to reporters, Netanyahu said "cameras should be everywhere" in order to keep the electoral process "pure". PM Netanyahu Seeks Record Fifth Term as Israel Goes to Polls. Arab parties, including Hadash-Ta’al and Ra'am-Balad have cried foul, charging the ruling far-right coalition of intimidating the Muslim voters from casting their mandate. One of the posters put by Ra'am-Balad, urging the Arab electorate to come out to vote "for their own future", was vandalised by suspected Lukid cadres. The miscreants also posted graffitis over it in Hebrew reading "death to Arabs". The Hadash-Tal'al, meanwhile, issued a statement appealing the Arab voters to not be feared out of exercising their right to franchise. The "radical right", said the statement, wants to push Muslims away from the ballot after estimating the community's electoral relevance. "But we also understand the power we have, and today we are going out to vote and nothing will stop us," it added. On the other hand, Netanyahu's top aide Yair Lapid said the ruling regime would return to power with a stronger mandate. The feelers received from the ground so far, he said, has indicated a landslide win for the Israeli PM. Notably, a total of 120 members are elected to Israeli assembly, known as "knesset" in Hebrew. The legislators are elected through proportional representation system.